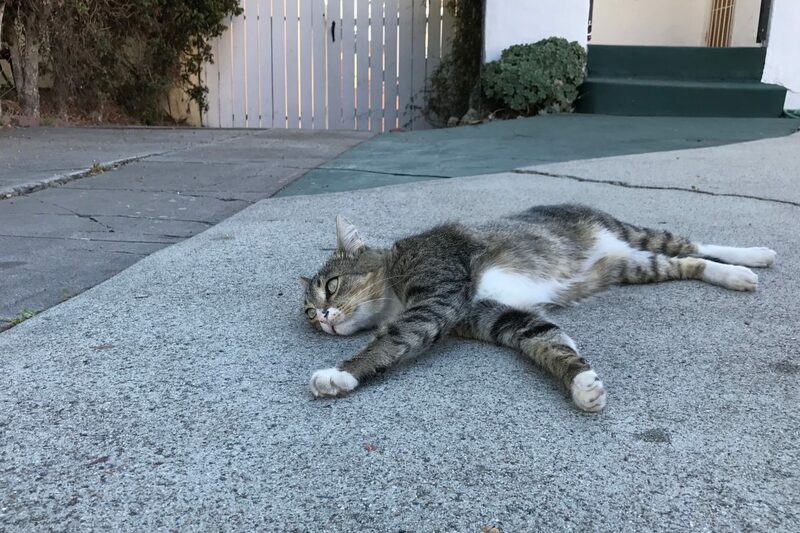 On Nov. 5, 2016, my wife Anne and I walked down Adams Ave. and back to Monroe by way of Arizona, where we spotted a kitty who receives my nickname Chill. We had crossed Texas Street, which is where the neighborhood of University Heights ends and North Park begins. As such, the feline really doesn’t belong in this series, but being so handsome how could he be excluded? I captured the Featured Image at 4:36 p.m. PDT using iPhone 7 Plus. Vitals: f/1.8, ISO 20, 1/190 sec, 3.99mm. The other furry felines featured previously: Scruffy, Roly Poly, Woo, Skull, Biscuit, The Colonel, White, Chipper, Frisky, Stretch, Needy, Farfisa, Mates, Hunter, Pee-Pee, Blue, Blue Too, Bonded Pair, Patience, Fess, Jumper, Frenemy, Looker, Cozy, Scout, Lurks, Skit, Mini, Betty, Black and White, Stalker, and Bell.